Today I have a recipe for you, which is perfect for a brunch, a party, as a gift for a birthday or just to snack in between! ? Namely vegan dumplings with spinach and homemade cashew ricotta. The best is that you can prepare them easy and even a day before, because you can serve them hot or cold. Both taste super delicious. Moreover, you can fill them so versatile, however, you want. Since I was invited to a brunch a few days ago and did not want to go there empty-handed, I immediately considered which savory snacks I could take with me. As you may already know, I really like the combination of garlic or onions with spinach, and somehow I like packing it in a pastry. 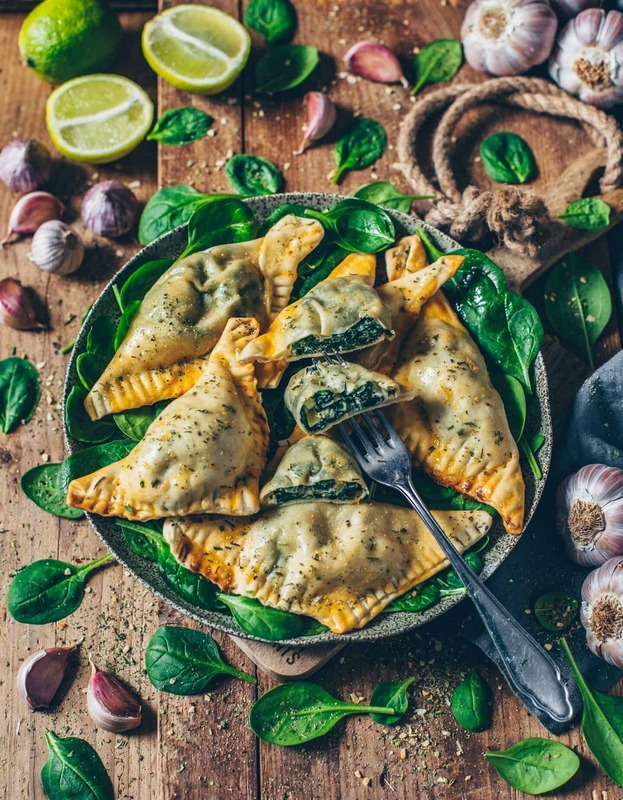 However, because I think that ravioli or pierogi are a bit impractical as a party snack, I decided to make savory stuffed dumplings. For the basic recipe of the dough, you need only a few ingredients, because the dough is just made of flour, water, oil and salt. These ingredients are simply kneaded to a dough and then left to rest for 1/2 hour. Later you can simply roll out the dough, and cut it as desired, stuff and fold. For a prettier shape, you can of course also use a ravioli or cookie cutter. Here I linked some -> “kitchenware“. 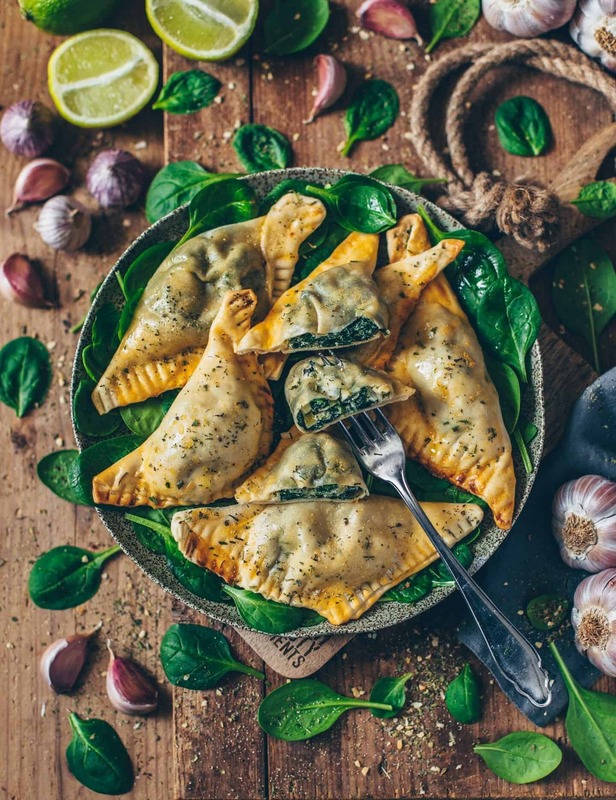 Of course, the filling can be created suitable to your mood from all kinds of vegetables, herbs, nuts and other plant-based products. Also, pestos are great as a filling. If you enter “pesto” in the search function here on my blog, you can also find some recipes. 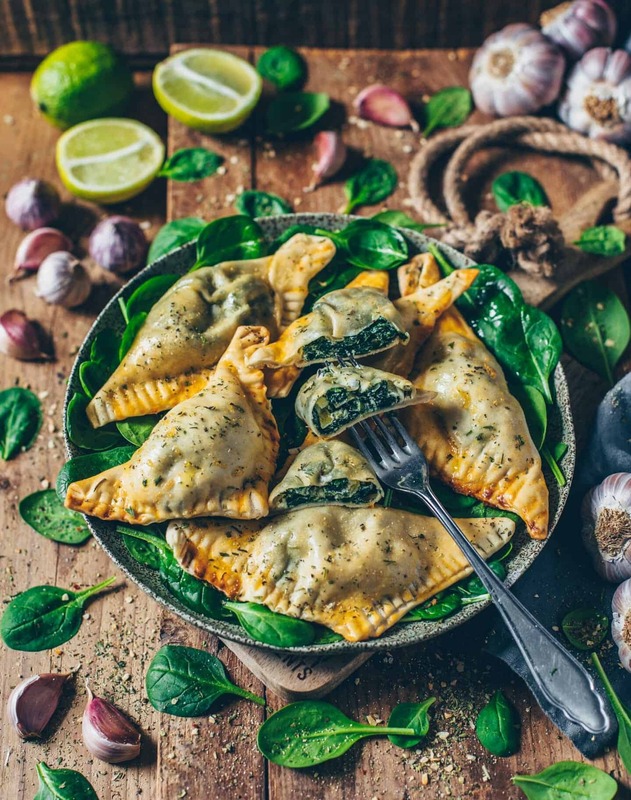 For this recipe today, I have chosen a vegan spinach-cashew-ricotta filling. I made the vegan ricotta myself from cashew nuts. But you can also use vegan feta or cream cheese from the supermarket. If you tried the recipe, I would appreciate a comment. You can also post a picture on Instagram and link it to @biancazapatka, so I can see your great creations. ? 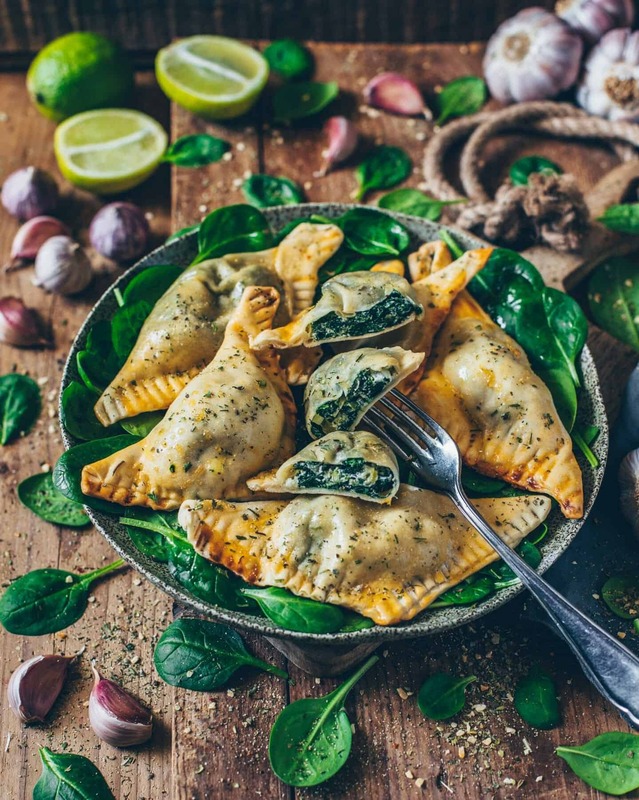 A delicious recipe for vegan dumplings filled with homemade cashew ricotta and spinach. 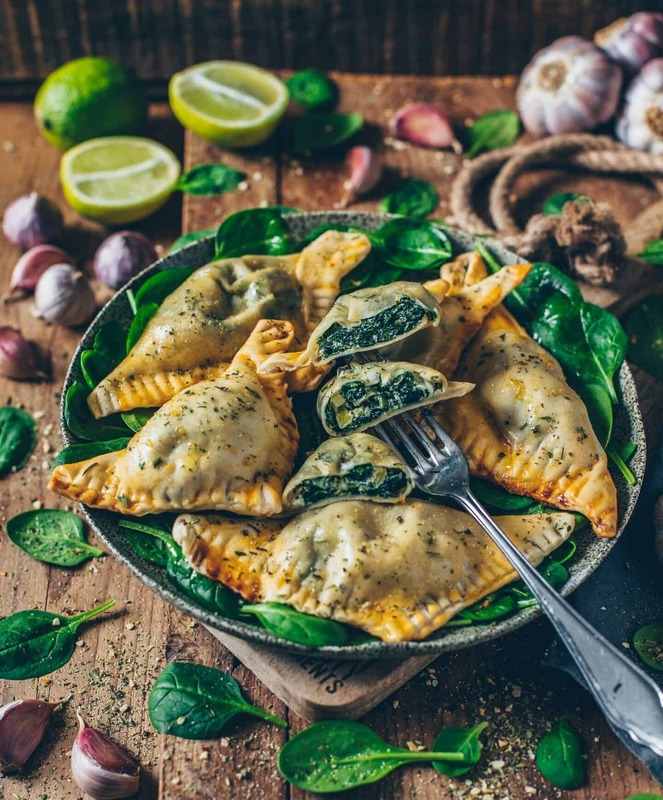 They taste warm and cold super delicious and are the perfect snack for any time but also as a side dish always suitable. Mix flour with salt and oil in a bowl. Add 125 ml of lukewarm water and knead everything with the dough hooks of a electric hand mixer to a smooth dough. Then let the dough sit for about 30 minutes. Wash spinach and allow to collapse in a skillet with a bit of boiling water while stirring occasionally. Then drain, squeeze a bit and finely chop. Wash spring onions and chop finely, too. Mix spinach, spring onions, cashew ricotta, nutritional yeast flakes (and lemon peel). Season with salt, pepper (and nutmeg). Fill the squares with a bit of the filling and fold them once diagonally. Press the edges with a fork. Brush a baking tray with oil and place the stuffed dumplings on top. Whisk the oil with milk, coat the dumplings with it and bake in a preheated oven (180°C top / bottom heat) for approx. 25 minutes until golden brown. For a faster version (without soaking cashew nuts) you can also cook them for just 10 minutes. If you do not want to cut the dough, you can also use ravioli or cookie cutters. 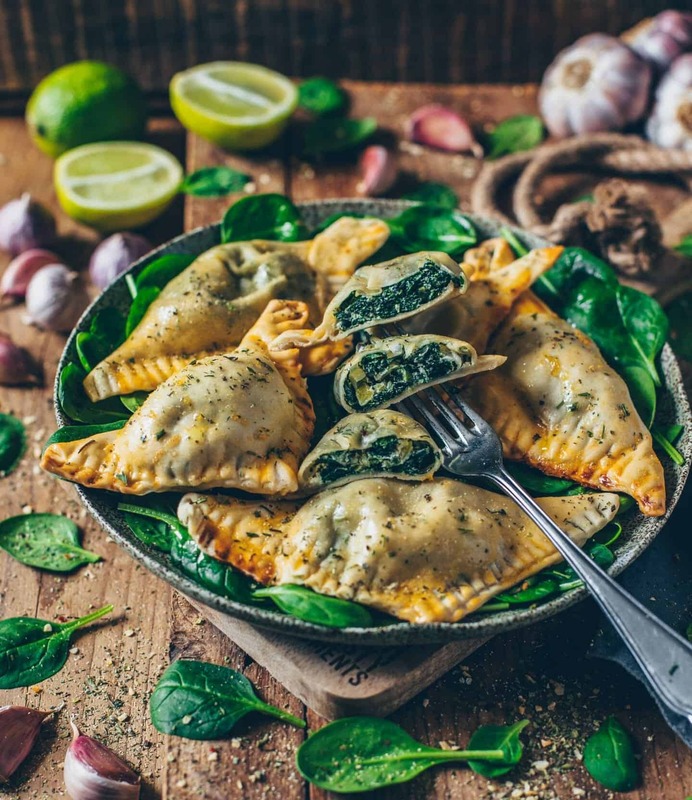 Hello…i am new here But I’m trying to understand why your recipe for the vegan spinach and ricotta feel dumplings has milk in it? There’s no dairy milk in this recipe! ? What is the purpose of nutritional yeast ? Does it have a substitute? Oh yum! I couldn’t resist this picture so just had to make these dumplings. They didn’t disappoint. Easy to make and super delicious. My whole family loved them. Will make again for sure!! Super delicious and easy to prepare! Third time I’ll make them. Thanks for sharing. So glad that you like the recipe so much! You need 100ml water but it‘s okay, if you use a little bit more. The amount depends on the size. You can cut them in a bigger size or smaller. I usually make about 9-12. 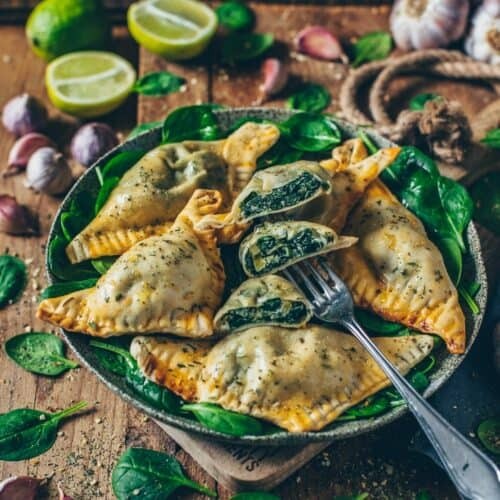 The absolute BEST vegan recipe yet! I just found Bianca on IG and I am SO excited to try all of her dishes. This was so much fun for my family and I to make!! Thanks Bianca!! Sorry i am an old dog and am confused about the measurements. The amount may vary depending of how many Dumplings you make and how much of the filling you add. However, if you have any filling left, you can serve it as Dip because it also tastes delicious how it is. I always recommend making more of the filling. You can store it in a sealed jar in the fridge for up to 3 days.